Electrical safety testers – often referred to as “hipot” testers – are an integral part of electrical and electronic equipment manufacturing. Hipot testers get their name from the high potential (high voltage) they produce to perform dielectric withstand and insulation resistance tests. 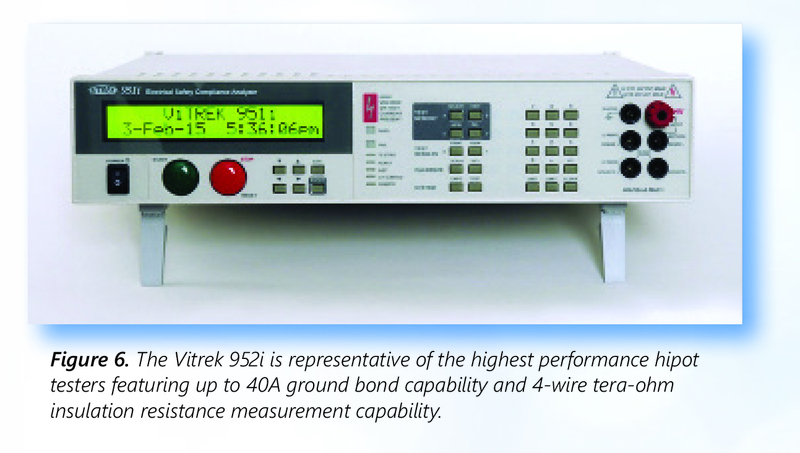 In addition to these tests, many hipot testers provide accurate low-resistance measurements and low-resistance/high-current outputs to test ground resistance and ground bond integrity. 1. Construction – Mechanical construction, spacing, clearances, etc. The IEC 61800-5-1 is a safety standard specified by the International Electrotechnical Commission for adjustable-speed electrical power drive systems. It covers the safety aspects related to electrical, thermal and energy. The former UL standard (UL508C) has now been supplanted by new standard, harmonized with the IEC requirements. To further help manufacturers address this often-bewildering array of international (and sometimes conflicting) standards, the Power Sources Manufacturers Association (PSMA) has established a standing committee and forum on its website. Once in production, products must be 100% tested to confirm with the related agency certifications and safety standards. Production tests are less stringent than initial certification but will generally include basic dielectric withstand and shock hazard (leakage) tests. Plug-connected devices will also be subjected to ground resistance and (if the standard requires) ground bond tests. Electrical motors, transformers and other such devices will likely include insulation resistance tests. Periodic inspection and calibration of test equipment is a standard requirement to maintain NRTL certification. Agency inspection will include check of hipot instrument calibration. This “cal cert” is typically required on an annual basis. (UL and other NRTLs require compliance certification with ISO17025.) Another common requirement prescribed by most NRTLs is a daily functional test of the hipot equipment. The basic hipot test applies a high voltage from the conductors to the chassis of the device-under-test (DUT). This test is often referred to as a “dielectric” or “voltage” withstand. Its purpose is to confirm that the insulation and isolation of the non-conducting surfaces from the operating voltage is sufficient to avoid a shock hazard. The typical specification for this test ins 1000V + 2 x normal operating voltage. 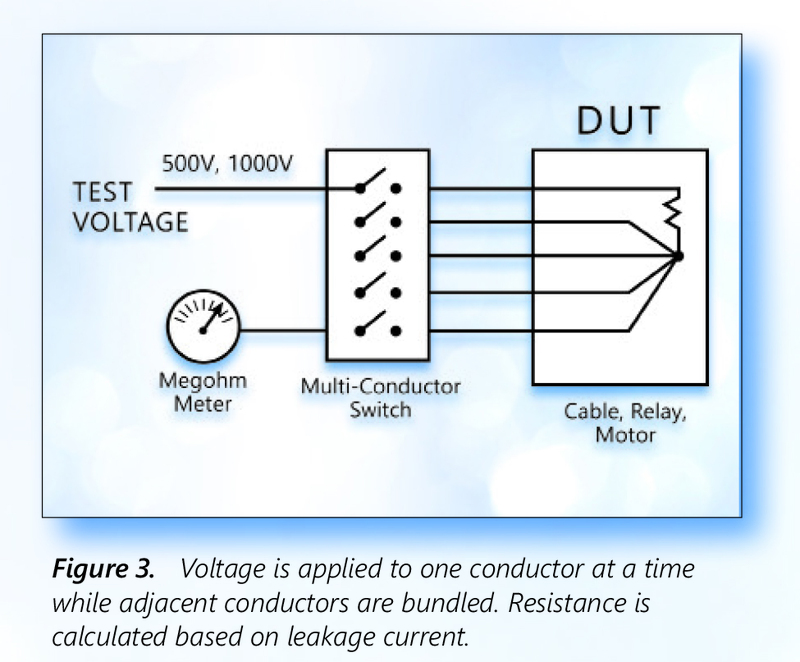 Four double-insulated products, higher voltages will often be specified in the test standard. In addition, this class of device typically requires special fixturing to connect the non-conductive outer shell to a conductive element. In many instances, insulation resistance needs to be measured between several conductors. Examples include cable/connector assemblies, multi-conductor cables and relays. To make this measurement, all the conductors except one are shorted together and the test voltage is applied from the remaining conductor across the bundled ones. Each wire is then, in turn, tested in this fashion. 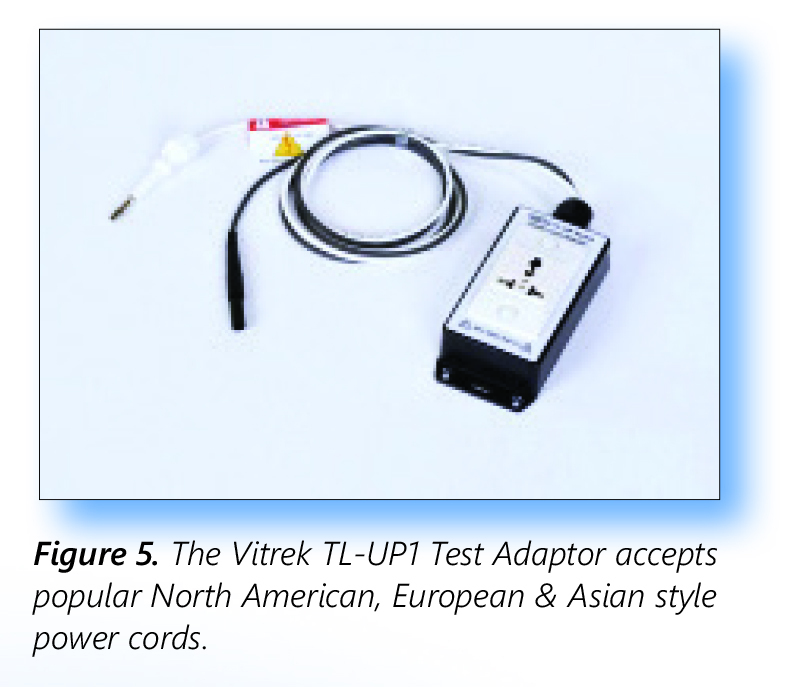 Vitrek’s TL-UP1 accessory is an example of an accessory device that simplifies ground continuity test setup. With its 4-foot leads, the accessory offers easy hipot and continuity test connection of corded products. Where ground continuity measures the resistance of the safety ground connection, the ground bond test assures the integrity of the connection. Using the same test setup a high current is passed through the circuit. If the ground bond is solid, the current passes without a change in resistance. If weak, the resistive heating of the current would induce a failure of the bond. Part 1 of this white paper discussed the functions and features of these high-performance instruments. The purpose of this section is to guide the hipot test user through the steps needed to make sure testing is done safely since potentially lethal voltages and currents are involved in the testing process. Because there is no substitute for operator competence, the importance of having trained personnel as the first step to a safe testing environment cant be overstated. The operator should be in good health, operators with special medical conditions should not work with high voltage. All operators should understand that high voltage is dangerous, and care must be taken to avoid contact with energized circuits. They should have knowledge of the effects of electrical currents on the human body and how best to avoid shock hazards. Operators should also be taught compression-only CPR. Other operator requirements include programming the necessary tests and storing them in memory. There should be a procedure available showing which memory location should be used for each individual device being tested. The procedure should also outline the test being performed (AC or DC, voltage, test time and limits.) The operator should use the key lock feature on the tester. This will avoid programs being changed to unknown values. Those who train the operators should explain the object of each test, show how it should be executed and show how to handle every normal and abnormal situation that may occur. Make sure each operator understands how much he or she can handle alone and when supervisory personnel should be called in for help. They should hold regular meetings to review and update safety procedures and regulations. The next step is determining where the test station will be located. The test area should be isolated from the factory assembly area. It should be located away from foot traffic to assure the safety of passersby and, of course, the safety of the station operator. Operator distractions should be kept to a minimum and the area should be conspicuously marked with internationally approved signage, such as “DANGER-HIGH VOLTAGE.” During testing, the hipot tester itself should have indicator lights to denote when high voltage is present. The work area and bench surface should consist of non-metallic materials, which means that metal work surfaces should be avoided, and no metal objects should be placed between the operator and DUT. All other metal objects should be grounded or be out of the test area all together. An ESD mat is not a recommended platform for your test station, as it may cause erroneous readings for leakage and is unnecessary in this application. In addition, the test equipment should provide for immediate and safe removal of the output voltage using internal discharge circuitry at the conclusion of the test or if the test is interrupted. Never remove power for the hipot tester. If there is a power interruption, use extreme care in any contact with the DUT. 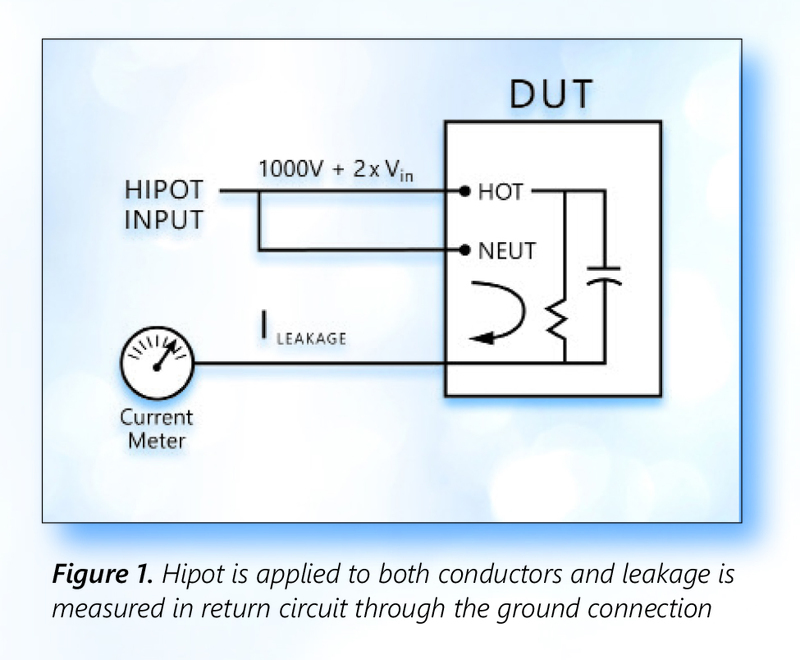 The safest approach is to leave the DUT connected to the hipot tester until power is restored and the tester can conduct its discharge function. The test station should have sufficient space for the tester and the DUT without the operator having to reach over the DUT to access the tester. The tester should be at least three inches away from the wall to provide proper airflow for the unit. Ideally the DUT should be isolated from the operator and tester. For larger DUTs, which are wheeled to the test station, the cart should be non-conductive and having locking wheels. (This also applies if the tester needs to be wheeled to the DUT.) Keep the area clean and neat and arrange the equipment so that it is easy and safe for the operator to use. There are many safety features that can be added to the test station to prevent the operator from encountering high voltage, such as guards or enclosures. When placed around a DUT they should be non-conducting and be equipped with safety interlocks that interrupt all high voltages when open. Interlocks should be arranged so that operators are never exposed to high voltages under any conditions. In addition, it is easy to implement circuit palm switches that prevent the operator from encountering high voltage during testing. The basic operation of a palm switch requires the operator to use both hands to initiate a test with, potentially, a foot switch to activate the test. If one or both hands are removed while testing, the test is immediately stopped. The switches are placed directly in front of the operator and spaced shoulders-width apart. Spacing the switches prevents an operator from trying to press both buttons down with one hand or object. No high voltage can be applied to the output terminals and DUT until both switches are pressed simultaneously. The operator cannot touch the DUT or test leads if both hands are on the palm switches. The palm switches are connected to the digital I/O on the hipot tester. When the switches are in the down position the start is enabled. Once the switch goes up the safety interlock is enabled, terminating the output voltage of the hipot test. This method is safe, quick and effective. 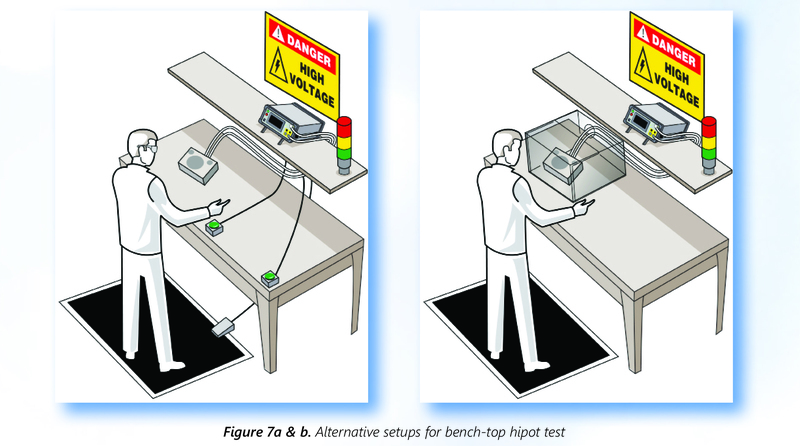 Figure 7 illustrates two alternative approaches to setup of a bench-top hipot test. In Figure 7a, the DUT is placed on the test bench and a combination of palm switches and a foot switch ensure that the operator cannot make contact with the DUT while the test is underway. The operator is wearing safety glasses. As a practical matter, the use of palm switches is typically restricted to short-duration tests done on a repetitive basis with a series of DUTs. If this test set-up is used for longer tests, operators will find a way to defeat the palm switches. In figure 7b, the DUT is placed under a protective cover with interlock to isolate the operator during the test. The use of an enclosure is a more reliable means to assuring operator safety, particularly when testing requires longer time periods. More elaborate test stations can include a hipot testers interlock. One safety method that utilizes the interlock is a light curtain, which is an infrared light beam that will open the interlock if anyone interrupts any part of the beam. The output of the light curtain is connected to the interlock terminal on the hipot tester. If the interlock is open, high voltage is immediately terminated. The light curtain is placed in between the hipot tester or the DUT and the operator. For the operator to touch the high voltage they would have to pass through the light curtain, hence opening the interlock, which will terminate the high voltage. If the hipot is placed behind the light curtain there must be a way to start the test. A foot switch is an easy solution. Keep in mind you must ensure that nobody can reach the high voltage by going around the light curtain. Once all of the connections are made and the prescribed test procedure is selected, the operator should confirm that all test parameters, according to the test documentation, are displayed on the tester screen. Operation of the test can then be conducted, keeping in mind the safety considerations described in this article. An appendix to this article provides a useful operator checklist for the setup and safe operation of a hipot test station. Electrical safety testing is a universal requirement for electrical and electronic equipment. Testing to the specific regional requirements can be a daunting task that is simplified by the programmable features and functionality of advanced hipot testers. NRTLs in every region of the world provide services to certify compliance with the specific standards and then regularly inspect the equipment and testing facilities used to perform production testing. 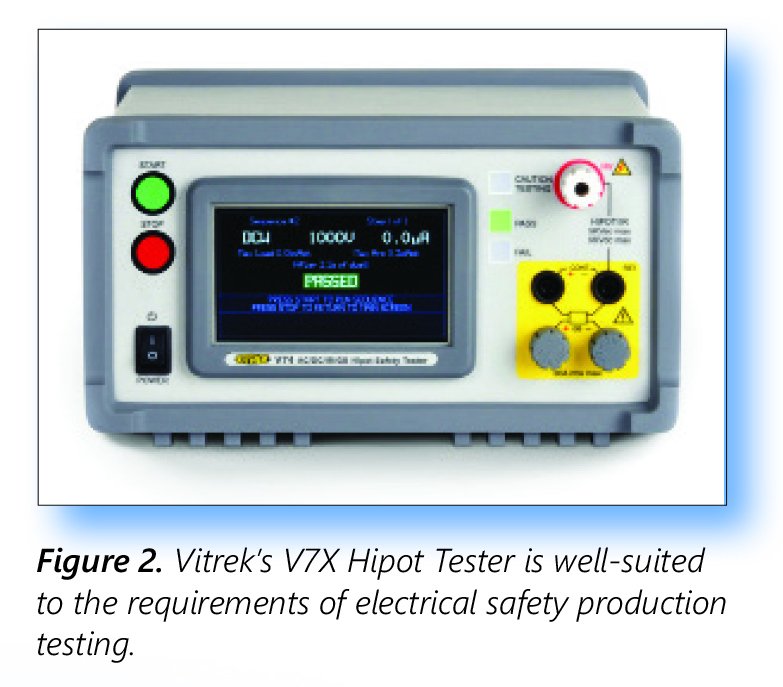 The capabilities of Vitrek’s advanced electrical safety testing equipment have been proven to be essential to efficient and accurate testing to the specific requirements of the devices under test. Electrical safety testing, by its very nature, requires strict adherence to procedures to assure operator safety. Only properly trained operators should be allowed to use the equipment and access the test area. Do not make any connections to a DUT unless you have verified that the high voltage warning light is OFF. Verify all DUT connections before starting a test. Make sure that no other objects are near the DUT or the tester. At completion of a test, observe that the HV light is out. If the test was DC, the discharge may take some time.